Crowdsourced journalism: a new democratic platform? You might think that there’s too much news content out there already. And it’s struggling to find a model to pay for it. But is it possible to find a way to discover fresh, quality material from ‘non-professionals’ that might satisfy a need for something different? And how could the huge potential for critical, creative journalism be harnessed while also encouraging rigour, honesty and professionalism? 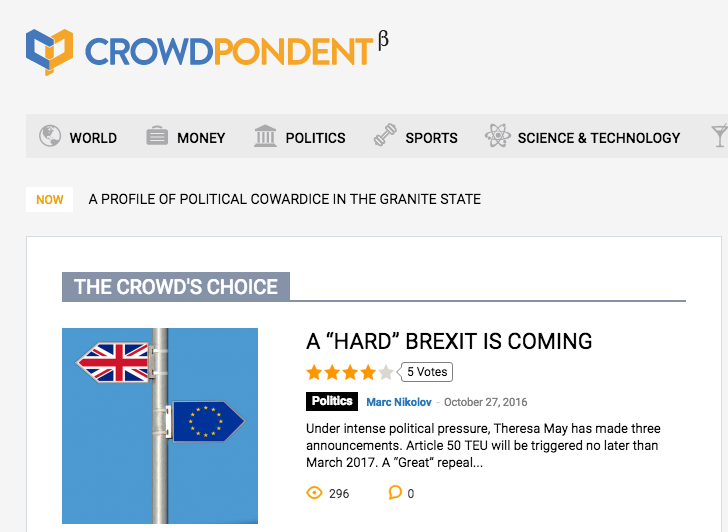 A new online media platform just launched in beta, Crowdpondent.com, is attempting to do this by crowdsourcing journalism. Dean Forrester,@ForresterDean, journalist and Chief Content Manager of the new website, explains. Conversely, on Crowdpondent the readers will then rate these articles and determine how prominent a piece will become on the website. The crowd therefore does not merely consume content. They create it, they read it and they rate it. Indeed, this rating will also impact how much the author will earn for their piece. Depending on the performance of their articles on Crowdpondent, authors will be remunerated. This payment is not just based on views however, but by how highly readers rate the piece and how much they engage with it. The platform ensures a minimum standard of quality by coaching writers and making sure content is concentrated into its most important, informative and concise form. But to further ensure clarity and concision, articles on the website are limited to 300 words. This not only facilitates promptness – as nothing beats speed in this digital age – but also allows readers to consume more information and traverse a spectrum of content. 300 words takes two minutes to read. Most readers rarely spend longer than that on an article before moving onto another. It is innovations like this that will capitalise on the technological advancements of our world and ensure high quality journalism has a prosperous future. Local reporting for a global audience, a mantra of the platform, is already occurring. But this is only the beginning. For the project to thrive, the crowd must get involved. The network of users must be expanded and solidified. Traditional publications will still have their rightful place, but grassroots and ground-up journalism must also be encouraged and refined. It is no easy task but this way more information can be gathered and more perspectives can be shared. Most importantly, properly crowdsourcing journalism like this will allow us to better understand the world we live in. Journalism, it is said, is the first draft of history – so surely everyone should have the opportunity to contribute? Blockchain for journalism beyond the hype | Futuribile on New Report: What use is Blockchain for journalism?